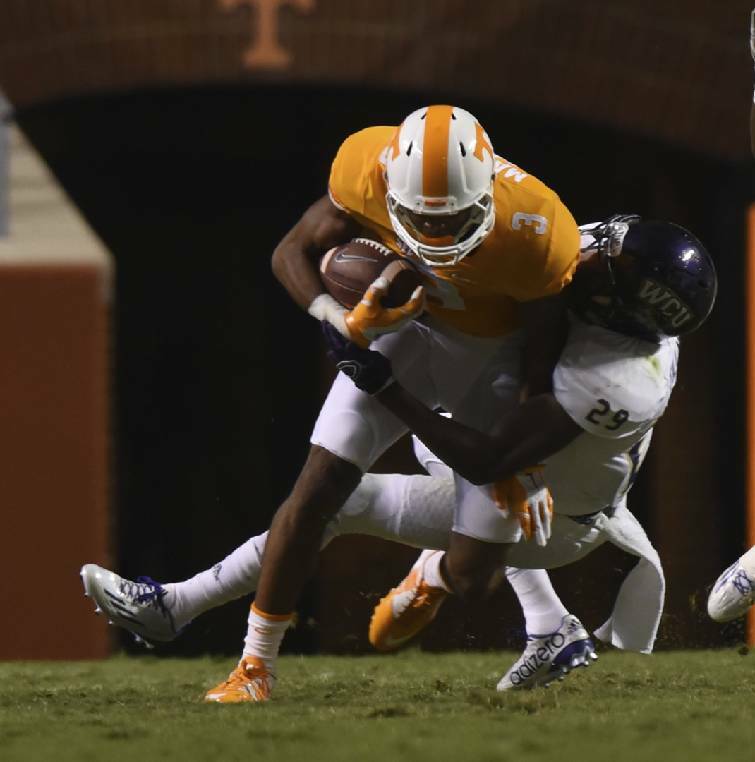 Tennessee wide receiver Josh Malone is tackled by Western Carolina's Marvin Tillman during last season's game in Knoxville. Malone had a strong offseason and could be a big playmaker this year for the Vols, who begin preseason practice tonight. KNOXVILLE — The Tennessee Volunteers report to Haslam Field this evening for the start of football practice as the preseason favorites to win the SEC East. With 17 starters back and a talented, experienced roster built through recruiting, the Vols, coming off a 9-4 season marred by some narrow, avoidable defeats and highlighted by a six-game winning streak to end it, appear to be on the verge of a special season. 1. Can Tennessee improve and maintain its overall health? The availability of some key players entering practice is unclear, while other players coming off injuries may be limited in some capacity. Star linebacker Jalen Reeves-Maybin (shoulder) isn't 100 percent, but he's progressing well and won't face a full workload during camp as Tennessee gives reserves Cortez McDowell and Quart'e Sapp increased repetitions. Defensive tackle Shy Tuttle, who last season against Georgia broke a shinbone and tore ankle ligaments in his left leg, requiring surgery, recently resumed running. He has worked hard during the recovery process to get back in time for the season, but the Vols won't take chances with him. Also, wide receiver Jauan Jennings and defensive end Austin Smith may be among the players limited to start practice. Tennessee will need a good season in terms of avoiding injuries to reach its goals. 2. Will two or three reliable playmakers emerge at receiver? With talent in the backfield and experience on the offensive line, Tennessee's running game, which rolled up nearly 3,000 yards in 2015, should be a sure thing and again could be one of the best in the Southeastern Conference. Uncertainty remains, however, about the consistency and efficiency of the passing game. While quarterback Josh Dobbs must become more consistently accurate, the Vols need their receivers to play better as well after a pair of underwhelming, injury-riddled seasons for that position group. Josh Malone impressed with his approach this summer, Josh Smith should continue to be reliable and Preston Williams will try to turn an impressive spring into a solid preseason and a breakout sophomore season. Tennessee only returns four wide receivers who caught a pass last season, so the Vols need at least two or three newcomers to contribute right away. Junior college transfer Jeff George flashed promise amid inconsistency during spring practice, and the freshman quartet of Tyler Byrd, Marquez Callaway, Brandon Johnson and Latrell Williams generated different amounts of buzz for various reasons during summer workouts. 3. Which newcomers are ready to make an immediate impact? The player most fans are excited to see and hear about from practice is defensive end Jonathan Kongbo, who could bolster Tennessee's pass rush. The freshman receivers finally get the chance to prove if the attention they got this summer was deserved or premature. Jarrett Guarantano could be Tennessee's quarterback of the future, though it may be too much for him to unseat Quinten Dormady as the backup this year. Freshmen defensive backs Marquill Osborne and Nigel Warrior look like future stars. The Vols won't need as many newcomers to contribute right away as they did the past two seasons, but a new season still brings attention to the new players on campus. 4. How will Bob Shoop sort out each level of his well-stocked defense? Tennessee's new defensive coordinator didn't get the chance to work with a full deck during spring practices because the Vols were without so many players coming off surgeries from last season. He often spoke about seeing the absent defensive linemen working out during the team's off days from practice and envisioning how stout could Tennessee could be up front. He fused a strong bond with linebackers Reeves-Maybin and Darrin Kirkland Jr. in the film room. He gushed about the speed and athleticism at his disposal in the secondary. When he was hired in January, Shoop was tasked with turning a solid defense into a championship unit, and Tennessee has the depth, talent and experience in place to bridge the gap. It will be up to Shoop and his staff to find the right combinations for every situation. 5. Can the Vols maintain the focus and drive of a championship team? For nearly eight months, this team has heard about how good it will be. It has enough leadership and experience to know the Vols have yet to accomplish anything, though, and the team has constantly referred to its own set of lofty expectations for the season. Tennessee should be filled with motivation to achieve redemption from last year's near-misses and deliver the program back to its place as a championship contender. Jones has praised the drive and hunger of his team during the offseason, and veteran players should ensure the Vols carry the same approach throughout this month and into the season.